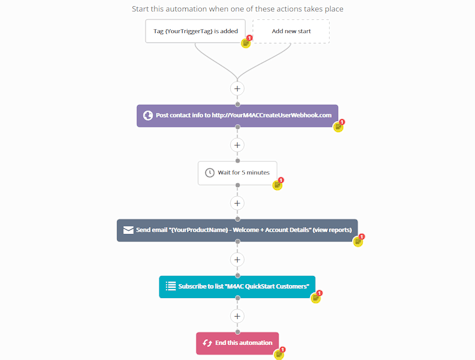 - Trigger a webhook M4AC will use to create a new user on your WordPress website. - Send the new user a Welcome email containing their new account details. - Subscribe the new user to an ActiveCampaign list of your choosing. Click the blue button to the right labeled, 'Add to your account'. A dialog will appear will a green check mark indicating, "You're all set!" From this dialog, click 'View your automation'. From that point forward, ActiveCampaign will prompt you for several inputs that customize the automation for your account and business. Each step in the automation contains a detailed note explaining the purpose of the step, how to customize it, and where applicable, optional configurations.